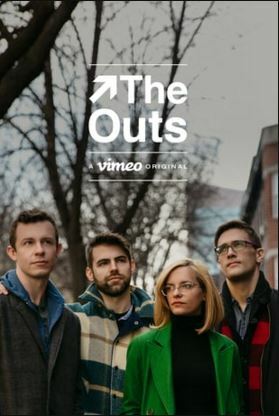 The Outs – Season 2 is one of the very best queer web series since… The Outs first season. I think it’s that good. It’s fun, humorous, poignant, and real. Sometimes it goes where you think it will, but other times the characters surprise us. I included the first season of The Outs in my ratings summary page, but I didn’t review it at the time. But I do remember binge watching pretty much the whole season in one sitting. (which is of course my benchmark for the best series). The only gripe I have right now with this season is that I can only watch one episode at a time as they are released. So far this season has taken the best of the characters and situations from the first season and carried them through to their next steps. Mitch and Oona are as caustic and witty as ever. Jack is still sweet but confused. These characters seem to represent parts of ourselves as we navigate love and life, and you can see yourself a little in each of them. Sometimes for me Mitch or Oona represent the voice in my head that I filter, while Jack is the part that always questions. The series is reminiscent of series like Looking or Eastsiders, but it’s different. I liked both of those series very much. The Outs seems more… crafted and careful. The journey it takes us on is not linear, but it takes us someplace. And I’m very much interested to see where this new, second season takes us. Thanks to Vimeo for whatever role they played in bringing it back!